Game developers have been trying to figure out how to paddle their way through pirate-infested waters for decades. 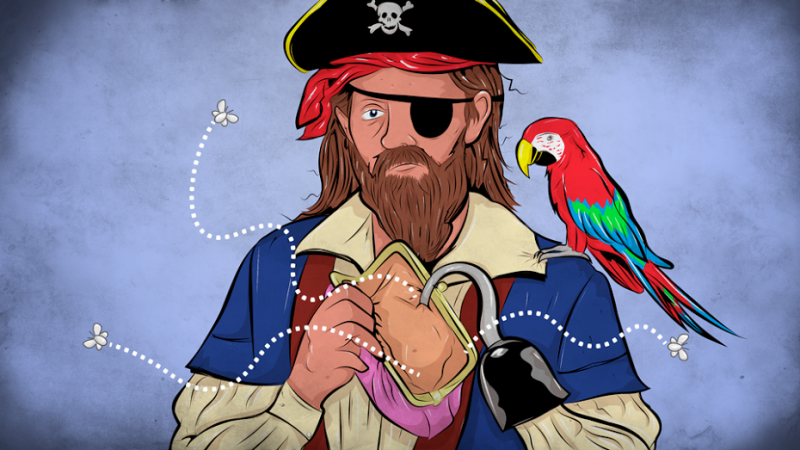 DRM, “glitches” designed to thwart pirates, and more DRM have done little to stem the tide. Seeing this, a handful of developers took less combative approaches, putting their games on sites like the Pirate’s Bay themselves. Months (or in some cases, years) later, they say it was a worthwhile experiment, even if it didn’t improve their sales all that much. TinyBuild’s Alex Nichiporchik put comedy platformer No Time To Explain on Pirate’s Bay back in 2011, with the twist that nearly all of the characters in the version pirates downloaded were clad in little pirate outfits. He says it definitely made an impression on people, generating a lot of “buzz,” even if he can’t measure the exact number of sales that buzz led to. Six years later, he still gets occasional emails from fans about it. Image: No Time To Explain. He added, however, that while the experiment was a success in that respect, it’s not something he’s ever repeated, because platforms owners like Valve, GOG, and Nintendo probably wouldn’t love it. “[If I were them], why would I give marketing to a title the developer of which openly supports piracy?” he asked. The developers of top-down horror game Darkwood put their game on piracy sites much more recently (shortly after it launched a couple months ago), and they told me the decision rippled out in ways they never saw coming. They received emails from people, some of whom said they didn’t even play horror games, with receipts proving they purchased Darkwood in support of the developers’ clear understanding that Pirates Are People Too. Darkwood also benefited from heaps of media coverage, some of which came from outside the world of video games. Developer Gustaw Stachaszewski told me that while all the publicity and good vibes only led to a “small bump” in sales, that’s mission accomplished in his book. “Our plan was to mitigate the potentially lost sales from people downloading the torrent with purchases from players who would not have heard about Darkwood otherwise,” he said in an email. For the developers of over-the-top shoot-’em-up Shooting Stars, putting the game on piracy sites was more of a learning experience than anything else. Piracy of mobile games, as it turns out, is a different beast than PC piracy, which put developer Ryan Holowaty and his team in an awkward spot. “Looking at it from the perspective [of getting buzz], I would say it was a success, but from an actual stopping of piracy standpoint, it was a misfire,” Holowaty said in an email. He explained that Android piracy often comes from direct downloads, rather than torrent sites, meaning that the “official” torrent didn’t really reach the bulk of pirates. In the end, said Holowaty, putting Shooting Stars on piracy sites did at least help his team evolve their anti-piracy tactics in future games like Framed 2, which automatically starts displaying ads if it detects that it hasn’t been officially purchased. But beyond that, it was kind of a wash.
Darkwood’s Stachaszewski, though, argued that traditional metrics only say so much when you’re dealing with piracy. What’s most important, in his opinion, is to get a dialogue going, to extend some kind of olive branch where once there was nothing but bitter animosity on both sides of the relationship.